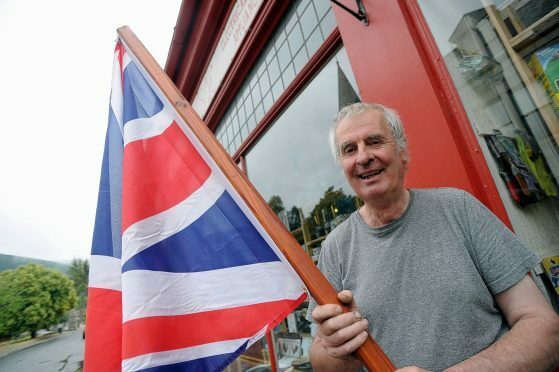 A well-known Deeside shopkeeper said he was “very pleased” to have been awarded a British Empire Medal for community work in his beloved Ballater. Alistair Cassie, 72, known locally as ‘Mr Ballater’ has run his Bridge Street General Hardware Store in the town centre for more than 40 years and is renowned for his community spirit. Born “just up the road” in Glenmuick, Mr Cassie was educated at Ballater primary and secondary schools and spent a year at Banchory Academy before attending Aberdeen Technical College. A television repair man from the age of 16, Mr Cassie was granted a Royal Warrant when he started maintaining the sets at Balmoral Castle, which grew as a business and expanded into the retail premises he still owns today. He has been involved in many community projects and is an active member of the local history group. He was also involved in the restoration of the AA phone box at Cambus O’May. He also “resurrected” the Ballater Business Association. Revelling in the community spirit of the village, Mr Cassie said he has been involved in “just about everything ” and added: “My heart is in the village. With no plans on retiring just yet, father-of-three, Mr Cassie enjoys curling in the winter, but “only real, outdoor curling” and, in the summer, is often found on the golf course – when he isn’t playing ‘Ballater Boules’ another group he helped to establish. Mr Cassie’s wife of 40-years, Margaret, opened the letter bearing the news of the honour.